Photo from the yarniad's Flickr Photostream. I realize that everyone and their mother have already knit this. And, to be honest, for a long time, I didn't get it. I mean, I thought it was a nice little shawl, but it seemed like it would be super boring to knit. And then I saw a couple up close. And holy sh*t are they pretty! So, now I think I need to make one. 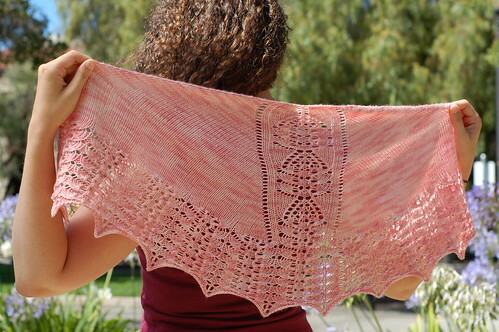 The Citron pattern is available for free on Knitty. 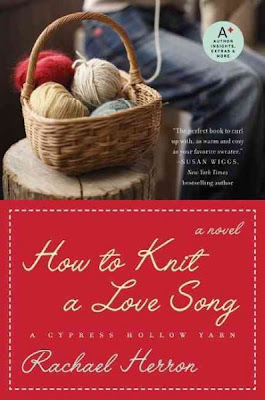 A couple of months ago, I was at my knitting group and one of the women there said she had just finished reading How to Knit a Love Song by Rachael Herron. Intruigued, I used my fancy iPhone and with the Amazon app was able to buy it right there at Panera. Um, I loved this book. Sure, it was a little cheezy and I thought the ending was a little predictable, but overall, loved it. It is definitely one to read if you are looking for something mindless. I would classify this book as knitrotica. :) It had lots of knitting in it, but there was definitely some dirty stuff in there too. Ok, about halfway through the book there was lots of dirty stuff. But, I don't know, I don't mind a little dirt in my book every now and then so it didn't bother me. I thought it was pretty tasteful. If you tend to read only fine, classic literature then I don't think this book would be for you. But, if you are like me, and like to sit down with a good Nicholas Sparks book every now and then, I think you would like it. Note: I purchased this book myself. I was not approached about reviewing this book nor did I receive any compensation for this book plug. To view my full disclosure policy, you can see it here. Another year. Another Stitches Midwest. I was able to locate the Bellingrath Pattern by Carrie of We Do Not Have a Knitting Problem as well as the yarn to make the shawlette: I actually have spent the whole weekend knitting on it. A great pattern and that yarn is great too. That is 4oz of Merino from Miss Babs. Can't wait to spin that up! There was lots of good stuff there and all my friends got some great stuff too. After Stitches, we went to Sweet Tomatoes (armed with coupons, of course), as this is my knitting group's annual tradition. It was a great start to my relaxing weekend of "doing nothing." My weekend consisted of knitting, watching The Office on DVD (as is the annual summer tradition around here. I like to watch all The Office episodes in order from the beginning), blocking my newest shawl design (hopefully more on that later in the week or early next week), and cooking some fabulous come cooked meals. Hope everyone that went to Stitches had a great time! Did you get anything good? So, I have faced the reality that I have yarn that I am not going to knit with, so I decided maybe it was time to destash. Here is a sampling of what I may have (I put the destash on Ravelry yesterday, so I can't guarantee that what you see here is still available...but you can check out my destash page to find out!) I have a few sweater amounts (I am realizing that I am not much of a sweater knitter) as well as some sock yarn that has been in the stash a little too long. So, today I am working a half day in order to make the short drive with my knitting buddies to Stitches Midwest this afternoon. In preparation, I have been on the lookout for one cool thing to get while there. 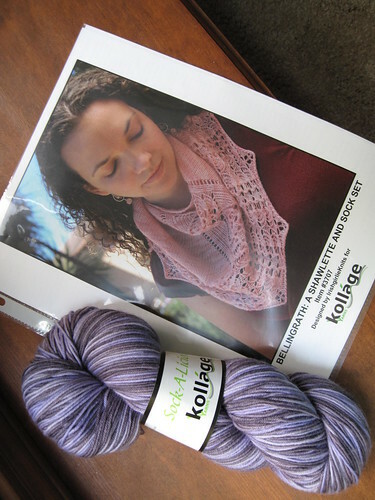 This week, Carrie from We Do Not Have a Knitting Problem, blogged about her new shawl and sock set that will be available in kit form at Stitches. And, I think I'm in love. Photo from cheekyattitude's Flickr photostream. Photo from Carrie Knit's flickr photostream. So, it's in the queue and I am going to try to acquire one today. 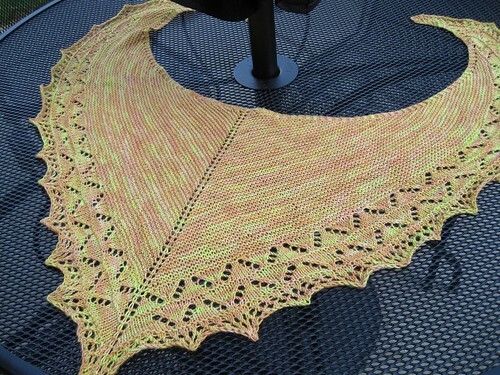 The shawl especially is making me squee! What's new in your queue? Definitely still have the spinning bug! 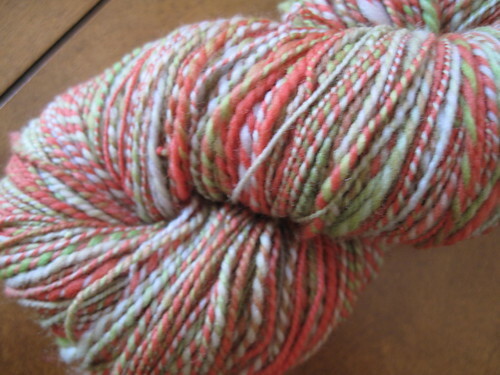 Here is the latest from my spinning wheel adventures: This yarn just makes me happy. I really love how the colors came out with this one. I ended up with 320 yards of a 2 ply. It's a little under 4oz. 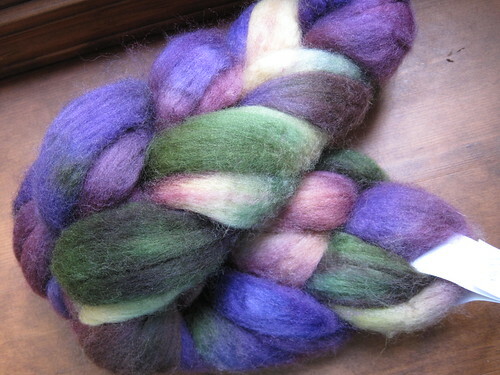 The roving came from WhimzyPinzy and is in the Rhubarb colorway. This stuff is so squishy, I could pet it all day long. 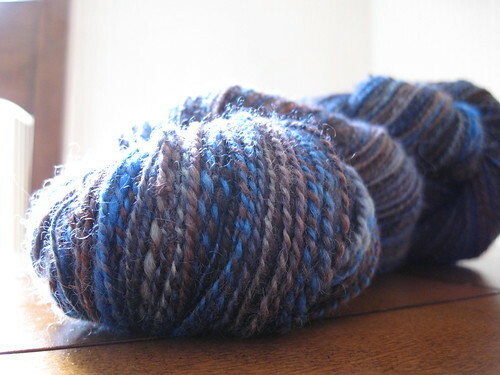 Immediately after I finished up this yarn I started spinning some new stuff. More on that next week! So, get any good yarn lately? Spin your own? So, I just finished up the first round of my Just Yarn Sock Club. I had such a good time doing it, I decided to open it back up again! 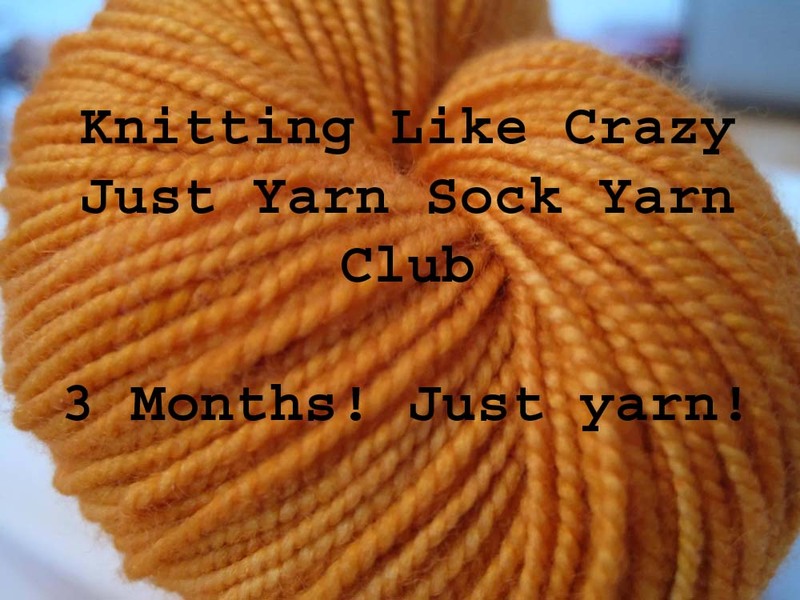 This listing is for a three month yarn club. Payment is all at once, up front for all three shipments. Please Note: This means you will be getting yarn EVERY OTHER month. The shipment will include a different base yarn each time. 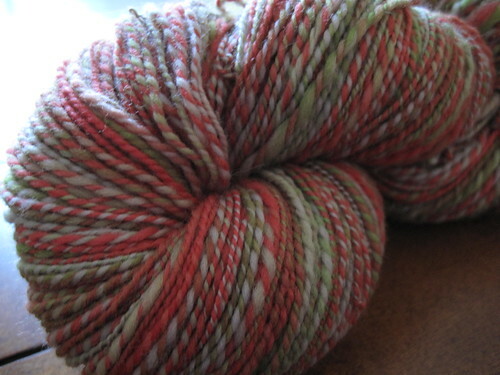 Two shipments will contain Insanity Sock, which is a 100% superwash merino yarn, 420 yards, per 4oz skein. One shipment will contain my new Crazy Cash Sock, which is 80% Superwash Merino/10% Cashmere/10% Nylon, 420 yards per 100g skein. The first shipment will contain a variegated colorway. The second shipment will contain a semi-solid colorway. The final shipment is knitter’s choice. Please let me know in the note to buyer section when purchasing if you would prefer a variegated or a semi-solid yarn. If there is no preference listed, then it will be a surprise for you (which could be fun too!) All colorways will be new ones! I am not sure which yarn bases will be for which shipments. That will depend on availability of the yarn. 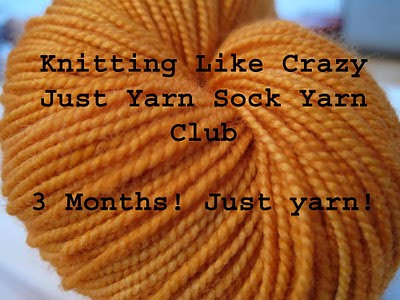 Basically, this club is for those that just love yarn. The kit will contain yarn only. No pattern, no extras. The cost of the club is $86, including shipping. For people within the US, your yarn will ship via USPS Priority Mail. For those in Canada, the UK, and everywhere else, your yarn will ship via USPS First Class International. If you want to join you can check out my etsy site: http://knittinglikecrazy.etsy.com. You can also just email me directly and I will send you a Paypal invoice. My email is jenATknittinglikecrazyDOTcom. I will probably accept up to 10 spots this time. C'mon, you know you want to. 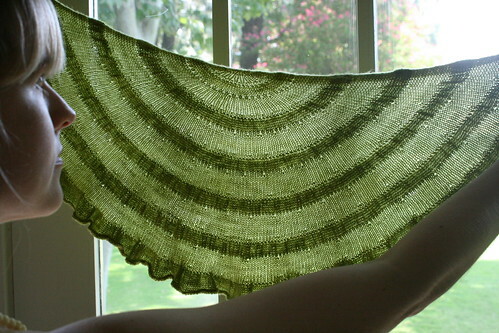 So, every now and then I like to look on Ravelry and see what people are making with my yarn. It really does make me feel good to see people putting it to good use. And, I always love seeing how the colors come out with each project. Those are knit with my Insanity Sock yarn in the Monkey colorway. I love the way here socks turned out! Finaly, there are Beth's Tidal Wave Socks. That yarn was part of my Just Yarn Sock Yarn Club from earlier this year. The colorway is Loops of Froot. Might be my fav socks I have seen knitted with my yarn! I have been a little busy for the last week or so. So, there has not been too much knitting going on. 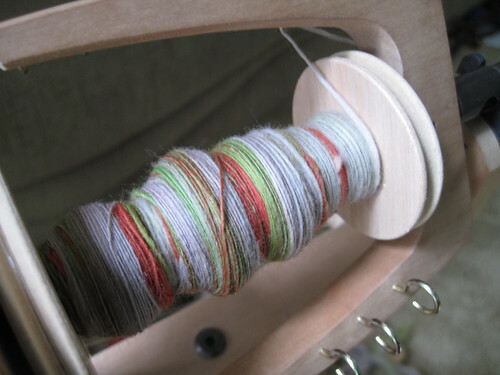 I have been spinning a teeny bit, while catching up on the 880-bazillion wedding shows I have recording on the TiVo. :) So, my latest spinning project is 4oz of Merino in the Rhubarb colorway from WhimzyPinzy: I still in the single phase. I am trying to spin thin again. I don't know if it is turning out as thin as the last yarn I made, but I am loving it so far. 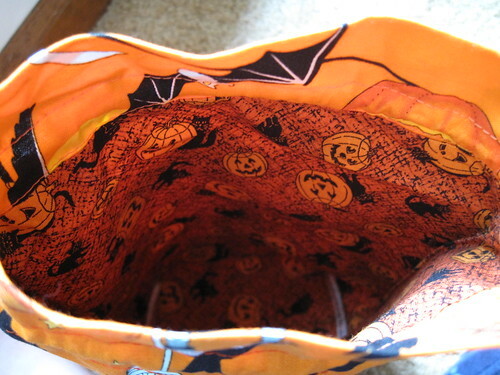 Halloween or not, this is going to easily become one of my fav new project bags. 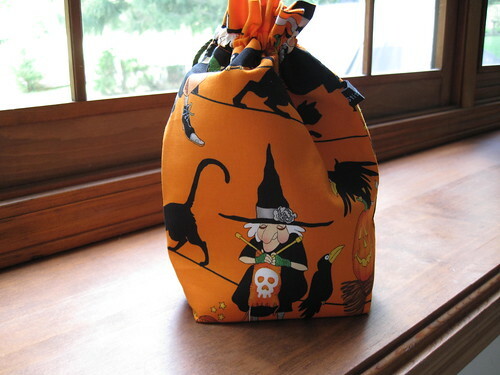 I think it might even beat out the knitting chicken bag (and I thought that would NEVER happen)! 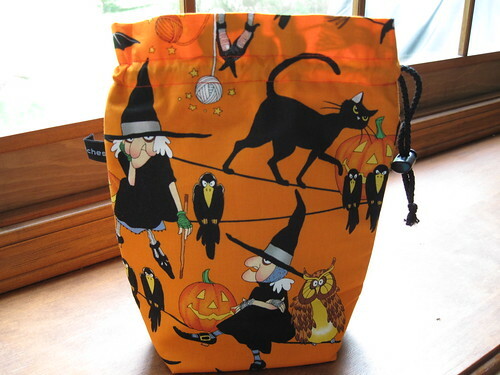 This is my third project bag purchase from ZigZag Stitches. Her stuff is awesome. Seriously, get one of her bags. As soon as possible. They are well-made, ship quickly (they do come from Canada, and I got mine in under a week), and her fabrics are totally unique. From the Queue Friday: It's Science! So, we recently finished all these crazy audits in the lab in which I work. And it got me thinking, I wonder if I have any good science things queued in the Ravelry queue? Photo from .serendip's Flickr Photostream. Since I work in a lab testing wastewater I am constantly covered in bacteria. So why not knit some? No, seriously, I think I may knit one and put it on my desk at work. It will be awesome. 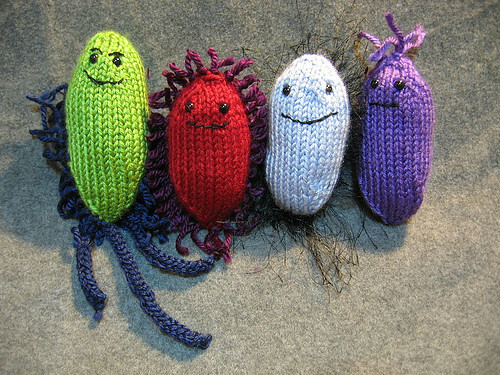 Want to knit your own bacteria? The pattern is available for free here. 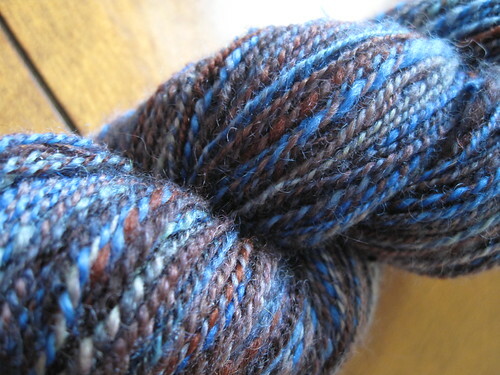 Yarn Thursday - Handspun Edition Again! Apparently this spinning bug just won't get out of my system! I had put the wheel away and then found myself longing for a little more spinning time. Like I said before, I try not to fight the spinning urge, so spin I did. 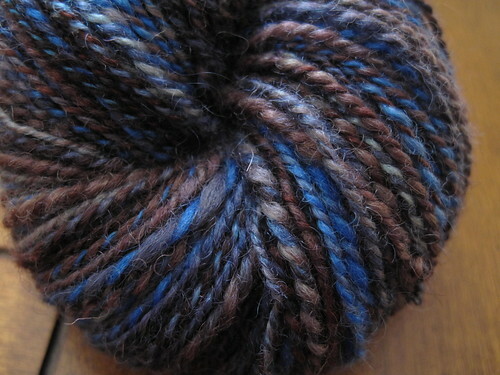 This was 40z of BFL in the Brickyard Blues colorway from Forest Fiber Works on Etsy. I love the way the colors came out in this. Just so pretty! I ended up with 335 yards in the end!! Yes! I think I may have finally gotten over the "I can only spin 200 yards of something" hump. I have no clue what I did different this time, but I was able to get my singles so much thinner this time. I did a 2-ply again because that is what is making me happy these days. So, last week was what I dubbed concert week. On Wednesday, Alex and I went to see Keane and then on Friday AND Saturday I went to Bon Jovi (hooray for winning tickets off the radio to the second show!). Anyway, all of these concerts were super awesome. When of the best parts was seeing Ingrid Michaelson open for Keane. I only knew that one song, "The Way I Am." Turns out, she is way way good. I think she might be one of my new faves. Alex came home and downloaded all of her albums for me, which have been on constant repeat since Wednesday. The point of this whole story is there one song that I just about flipped out when I heard it in concert. Um, the song talks about knitting! Everything about this song is great, but knitting too? Uh, yes please. So, I can't help it, I am sharing the lyrics. I am like a teenage girl. I think I have listened to this song four times just today! "I simply can't sleep in this tiny bed with you anymore." Knitting Like Crazy is hitting the classroom! I have a very exciting announcement on the blog this morning (if you follow me on Twitter, then you probably already saw it last week). I am teaching a class at my LYS!!! It's the Carefree Shawlette class at Fuzzy Wuzzy Yarns in Arlington Heights, IL. 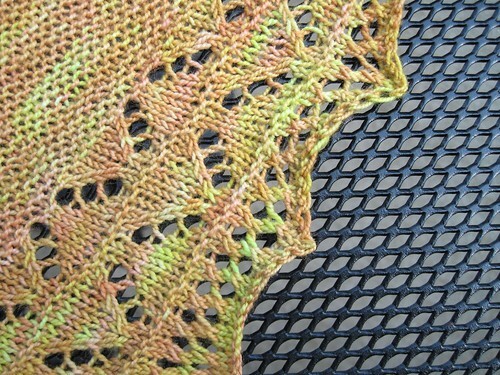 Learn to make Jen's Carefree, a shawlette using garter stitch with a lace border. Her sample is on display in our shop, and if you know how to do a yarn over, knit two together and an SSK, you can make this! 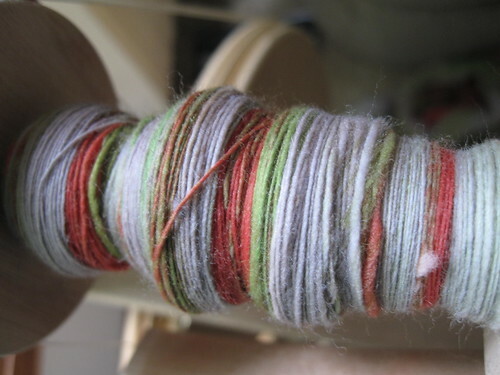 Participants will be using their choice of Jen's hand-dyed yarn that she's dyeing especially for this class. Three two-hour classes - $90 (COST INCLUDES JEN'S YARN AND PATTERN). Wednesdays, 7 - 9 p.m. I am super excited about this. I really hope some of my local blog readers can make it. I promise it will be a good time! Too far away to take my class? That's ok. You can get my yarn here and the pattern here. Maybe we can do an online knit-a-long? Let me know!